As a verified admin, you can erase a user from Yammer to comply with a General Data Protection Regulation (GDPR) data subject request. When you erase a user, personally identifying information about the user is removed. This does not remove the user's messages or files. You can review a user's messages and files in order to decide which ones to delete. Any content associated with the user that remains will be identified with an ID, but not with the user's name. Before deleting data or erasing a user to honor a GDPR data subject request, your network data retention setting must be set to Hard Delete. Choose the approach that makes sense for your situation, and follow the steps in the order listed. The order matters: once you erase a user you can no longer find their data to delete it. Keep all messages and files created by the user. Remove the user by using the Erase the user option. This removes the user from the home network and any external networks they belong to, but does not delete any of their messages or files. Delete all messages created by the user and decide which files to delete 1. Do one per-user export of the user's data for the home network, and one for each external network they belong to. 2. Review files in each external network's export, and delete the files as necessary. 3. Remove the user from each network by using the Permanently remove this user, and remove their messages option. 4. In the home network, use the Erase the user option. Review files and messages created by the user and decide which to keep and which to delete 1. Do one per-user export of the user's data for the home network, and one for each external networks they belong to. 2. Review files and messages in each external network's export, and delete the files and messages as necessary. 3. In the home network, use the Erase this user option. * If you prefer to have more than 14 days to review and delete files and messages, you can do this prior to erasing the user. Closing an AAD account does not delete the user and their information. For deletion of user information you must go the Yammer admin center and complete the instructions provided below. When you're doing the actual erase of the user and deleting their data, the network data retention policy must be set to Hard Delete. If your data retention policy has been set to Soft Delete in the past, data the user deleted will show up in the data export. In order to permanently delete the soft-deleted data, you must delete it while the network is set to Hard Delete. To see the data retention settings for your network, go to Yammer settings > Network Admin > Content and Security > Data Retention. If needed, change the settings to Hard Delete. In Yammer settings, select Network Admin. Under Content and Security select Data Retention. You must export user data for the home network, and for each external network the user is a member of. In the Yammer admin center, go to Content and Security > Export User Data. Type the user's name and select the user. Data is exported into a .zip file containing the following files. Summarizes the number of entries in each .csv file, and lists any errors that occur during the export. Parameters use for the export. For any live event video posted by the user, includes the network ID, group ID and name, title, description, links to the video, and additional information about the video. For any file added or modified by this user from Yammer, lists the Yammer ID, type of file, name, description, and path to the file, along with metadata including the group it was posted in. The storage_path column shows whether the file is stored in Yammer or SharePoint. Files.csv does not contain the actual files. Files that are stored in Yammer are exported in their native format to the Files folder of the zip file. Files that are stored in SharePoint are not exported. The file_ID and path columns in Files.csv can be used to identify the files in the Files folder or to go directly to the file in Yammer. For information about how to go directly to a specific file, see Delete specific messages or files. For files that are stored in SharePoint, use the download_url column to download the file. Or, you can use Content Search in Office 365 to find files stored in SharePoint and created or modified by a specific user. To delete a file, whether it is saved in Yammer or SharePoint, always delete it from Yammer. This erases the metadata in Yammer as well as the metadata and file in SharePoint. If you delete the file from SharePoint directly, the Yammer metadata still remains. For any group created or modified by the user, lists the Yammer group ID, name, description, privacy status, whether the group is internal or external, link to the group, creation date, and updated date. This file also includes the aggregated total number of polls the user voted on, and the polls the user created. For any message liked by the user, lists the message ID, thread ID, group ID, group name, privacy status, sender ID, name and email, the full body of the message, the ids for attachments, and creation and deletion information. A list of polls you created will also be provided. For announcements, includes the title of the announcement. For any message sent or modified by the user, lists the message ID, thread ID, group ID, group name, privacy status, sender ID, name and email, the full body of the message, the ids for attachments, and creation and deletion information. A list of polls you created will also be provided. For announcements, includes the title of the announcement. For information about how to go directly to a specific message in Yammer, see Delete specific messages or files. For any topic created by the user during the specified date range, lists the creation information and a link to the topic. This folder contains files that are stored in Yammer and have been created or modified by the user during the specified time period. It does not contain Yammer files that are stored in SharePoint. Files are in their native format and are named with their Yammer ID. For example, a PowerPoint presentation might be listed as 127815379.pptx. For information about how to delete a specific file, see Delete specific messages or files. When the user's account activity data is ready, you'll receive a Yammer inbox message with a link to the data. Click the link to open it. Exported data does not contain bookmarked messages, group membership, followed or following users, followed topics, and the user's notification, application, and language settings. To find this data for an individual user, click the Yammer settings icon , click People, and click the name of the user whose data you want to view. This page shows the user's profile, conversations they've participated in, any files, images, and videos they have posted, along with their bookmarks, followed and following users, and followed topics. Use the Yammer file ID from the export to go directly to the file in Yammer and delete it. For Yammer files stored in SharePoint, delete the files from Yammer in order to remove the Yammer metadata as well as the file. Build the URL for the message. Use https://www.yammer.com/network_name/#/Threads/show?threadId= thread_id. For example, http://www.yammer.com/contosomkt.onmicrosoft.com/#/threads/show?threadID=135893. You can also build the URL for the file. Use https://www.yammer.com/network_name/#/files/file_number, for example https://www.yammer.com/contosomkt.onmicrosoft.com/#/files/12345678. On the Yammer page for the file, click Delete this File. There is some user data that is not included in an export. To find this data for a user, go to Yammer settings > People, and click the name of the user. The following table shows how to change or delete this data if needed. 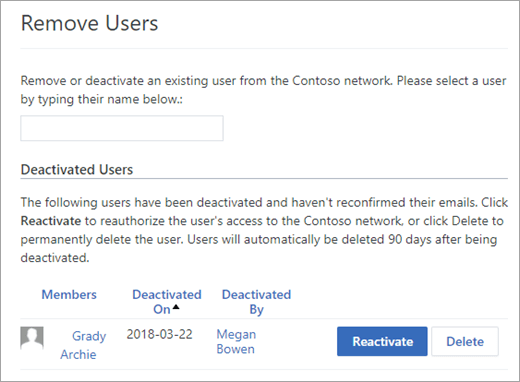 When you select the Erase a user from your Yammer home network and external networks to remove a user from Yammer, this information is deleted after the 14-day suspension period. A user can change or delete this information. For steps, see Tips for staying organized in Yammer. 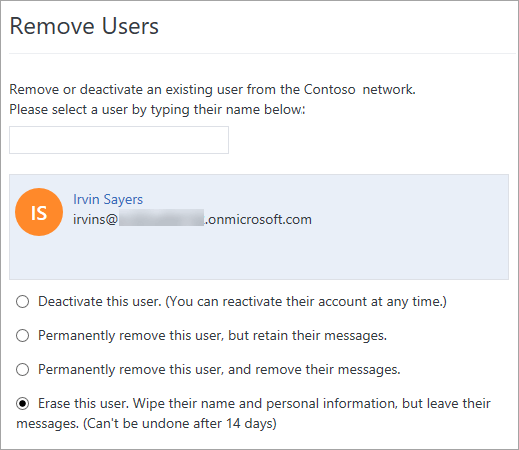 When you select the Erase a user from your Yammer home network and external networks to remove a user from Yammer this information is deleted after the 14-day suspension period. As an admin, you can't change this information for a user. A user can change their own settings. For steps, see Change my Yammer profile and settings. - When you select the Erase a user from your Yammer home network and external networks to remove the user from Yammer, this information is deleted in Yammer after the 14-day suspension period. - The user has full control of their own profile, and can modify the values. For information, see Edit the user's profile and settings (done by user). If the user has an Office 365 identity, the Yammer user profile is pulled automatically from Office 365, which gets the profile information from Azure Active Directory (AAD). Yammer users can temporarily change their profiles in Yammer, but these changes are overwritten when there is a change in AAD, so to permanently change or delete a user's profile, you must change or delete directory data in Office 365 and AAD. See Manage Yammer users across their lifecycle from Office 365 and Add or change profile information for a user in Azure Active Directory. A user can edit their own profile. Administrators can't change the user profile or settings. The user can click the Yammer settings icon , and then click Edit Settings. When you erase a user, there is a 14-day window for you to decide which files and messages to save or delete in the home network before the user-identifying data is completely erased. If you want to review and delete some or all of the user's messages and files, be sure to export user data and do the deletions before erasing the user's account, or within 14 days after selecting Erase this user. After the 14-day window, files and messages will continue to exist but will be marked as belonging to a former user. After a user's account transitions from deactivated to removed, you can no longer associate user data with the user, which means you can no longer export and review their data. If you want to review and delete messages and files in external groups, external threads, and networks that the user is a guest member in, follow the instructions in Export data for one user and Delete specific messages or Yammer files stored in Yammer or SharePoint before erasing the user. As soon as you click Erase this user, you will no longer be able to associate the user with these messages and files. Removing a user from their home Yammer network will also remove them from all external networks. You must remove guest users separately in each external network they are a member of. As an admin, you can erase a user from your home network and from any external networks they belong to. Enter an existing user's name. After you select the user, the options for removal are displayed. If you want to keep all the user's files and messages, select Erase this user. Select Erase this user. Wipe their name and personal information, but leave their messages. (Can't be undone after 14 days): This deactivates the user for 14 days so that you can export user data and evaluate home network files and messages before the user is permanently deleted. This option marks the user as deactivated. The deactivated user is listed on the Remove Users page. Within 14 days, you can reactivate the user. After 14 days, a message is sent to all the networks admins and verified admins informing them the user has been deleted. In the confirmation dialog, click Yes, Permanently Delete Account. Within the 14 days, follow the directions in Export data for one user and Delete specific messages or files. Select Permanently remove this user and remove their messages, and then click Submit. When that completes, select Erase this user. This removes the user's name and activity data. When a user's account gets deactivated by using the Erase this user option, you have 14 days to reactivate the user. Go to the Deactivated Users section. This section will only be visible when there is at least one deactivated user account. Click Reactivate for each user you want to reactivated. After 14 days, the user cannot be reactivated.